The Cascades at the Grottos. The smooth rocky edge of this tumult is very slick and the river is unforgiving at this level. A view from what some local boaters are calling North Star Lake or Lake Stillwater also known as the Roaring Fork River in flood stage. The river just barely reached the official flood level early Wednesday, June 17. ASPEN/BASALT – After a warm Tuesday afternoon followed by a tumultuous evening thunderstorm the upper Roaring Fork River east of Aspen reached a new peak in its surprising 2015 run-off season, hitting a flow rate of 1540 cubic feet per second early Wednesday morning. The river, as measured at Stillwater Drive, also reached a gage height of 5.02 feet– just over the official flood level of 5.0 feet for Aspen proper– at 6:30 a.m. Wednesday. (And by early Thursday morning, at 1:15 a.m. June 18, the river had risen again to 1,660 cfs and to 5.25 feet – back over flood stage). 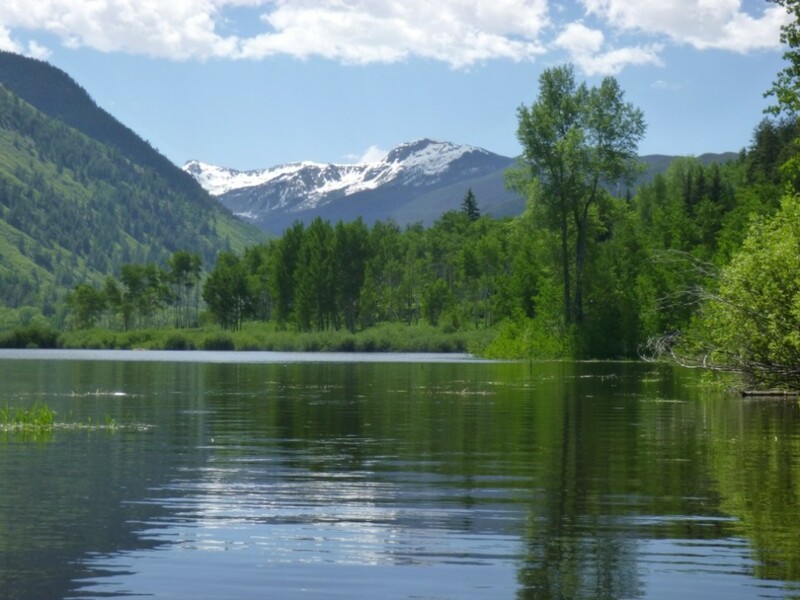 By 9 a.m. Wednesday, the Stillwater/North Star section of the Roaring Fork was more of a lake than a river, with boatable water spread wide across usually dry meadows. A cabin dating to the mid-1960s in the Stillwater section of the Roaring Fork River was flooded Wednesday, with standing water in the living room and in a nearby art studio. 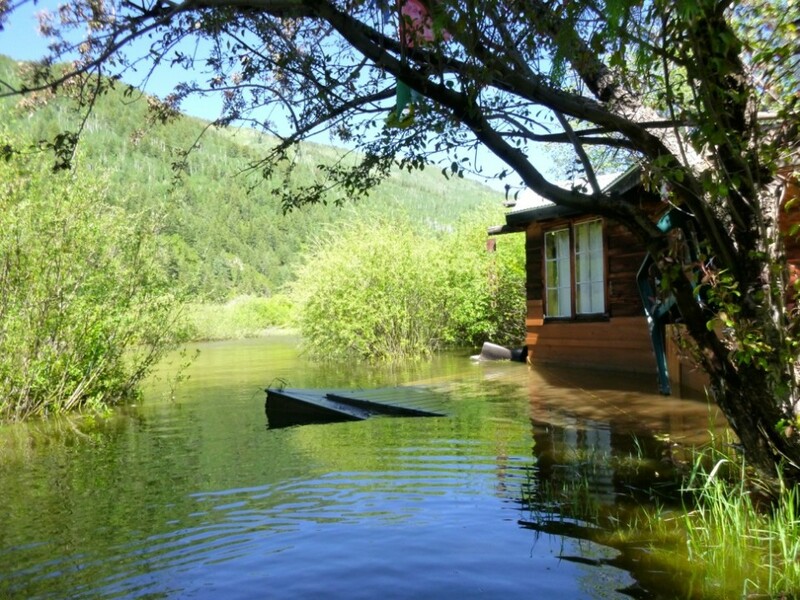 The small wooden cabin dating to 1965 at river’s edge near Warren Creek had several inches of standing water in its living room. It was the wettest the cabin had gotten since the river jumped up from 300 cfs on June 3 to 1000 cfs on June 6, where it has hovered since. Blair Weyer, the public information officer for the Pitkin County Incident Management Team, said Wednesday afternoon there had been no property damage reported in the city of Aspen from the high water, and she’d not been made aware of any damage in the county, outside of the river cabin. By 4:30 p.m. Wednesday the Roaring Fork east of Aspen had dropped almost 200 cfs, to 1360 cfs. The gage height read 4.68, below the official flood stage. Lincoln Creek coursing through Lincoln Gulch, just above the Lincoln Gulch Campground. Lincoln Creek looks like a powerful river, not a mild creek. The upper Roaring Fork is flowing down from Independence Pass and into Aspen in a mostly natural state, although some water is still being moved to Grizzly Reservoir, which is part of the Independence Pass Transmountain Diversion System. The water diversion tunnel that normally sends about 600 cfs of water under the Continental Divide to the east slope has been closed since June 2, except for a 24-hour period on June 12 and 13 when it moved about 200 cfs east in an effort to alleviate flooding in Stillwater. “We have no demand for the water and no place to store it,” said Kevin Lusk, the president of the board of the The Twin Lakes Reservoir and Canal Company, which operates what’s often referred to as the Independence Pass-Twin Lakes diversion system. Lusk is also a principal engineer at Colorado Springs Utilities, which owns 55 percent of the shares in the Twin Lakes Reservoir and Canal Company. The Pueblo Board of Water Works owns 23% of the shares, the Pueblo West Metro District owns 12 percent, the City of Aurora owns 5 percent, and other smaller shareholders control the last 5 percent of the shares. The Twin Lakes Reservoir, on the east slope, is 94 percent full and it has no more room for water from the Roaring Fork, Lusk said, and the wet weather has meant people in Colorado Springs and Aurora are not using very much water to keep their lawns green. “Basically, the rain has affected everything back up through the system,” Lusk said. With the diversion tunnel closed, the upper Roaring Fork River below Lost Man Campground and Lincoln Creek below Grizzly Reservoir are both flowing at unusually high levels, and Tuesday’s rain appeared to given an extra boost of energy to the rivers. 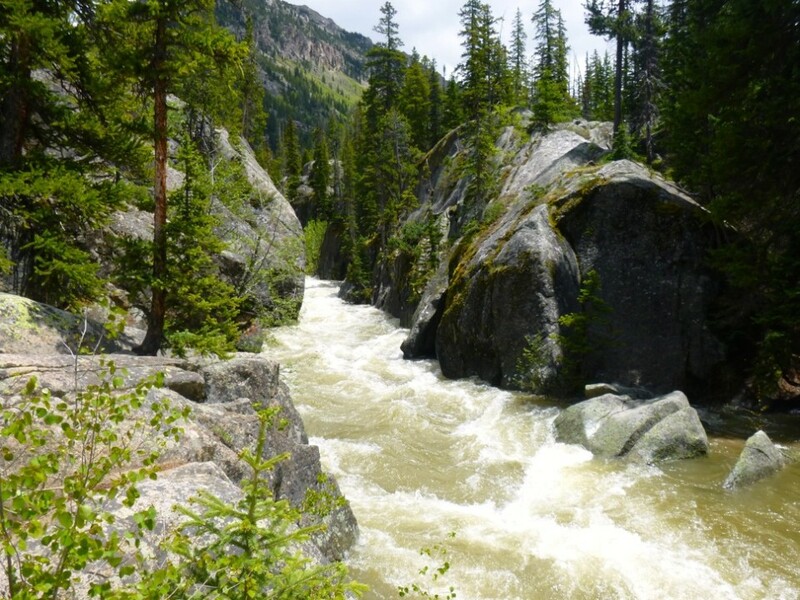 The combined flows of Lincoln Creek and the Fork, which come together just below Lincoln Gulch Campground, produced a true whitewater spectacle Wednesday in the steep and rocky Cascades section of the river, which is in the Grottos day-use area. Downstream below Aspen, the Slaughterhouse section of the Roaring Fork River, as measured below the confluence with Maroon Creek, hit 3550 cfs at 4:45 a.m. Wednesday, which is big water for that section. For example, Blazing Adventures, a local rafting company, does not run commercial trips down Slaughterhouse when it is running over 2000 cfs, in large part because the low Stein bridge below the Airport Business Center. But on Wednesday both Blazing and Aspen Whitewater Rafting were both running trips down the less-intense Toothache section, which is below Slaughterhouse and runs though Woody Creek and Snowmass Canyon. The floodplain on the former site of the Pan and Fork trailer park was evident on Wednesday morning, as the Roaring Fork River overtopped - by design - new rock work installed along the river. In Basalt, people awoke to the sight of more water overtopping the river-right bank below the Midland Avenue Bridge, where extensive rockwork was installed last fall. The rockwork was designed to let the river flow over it and into the 100-year floodplain. And the river, running at 4,360 cfs as measured near Emma at 5:30 a.m. Wednesday, seemed happy to comply. The floodplain at this point on the river stretches about halfway from the normal edge of the riverbank up to Two Rivers Road, where half of the Pan and Fork trailer park used to sit. And on Wednesday morning, the floodplain in Basalt was definitely flooded. 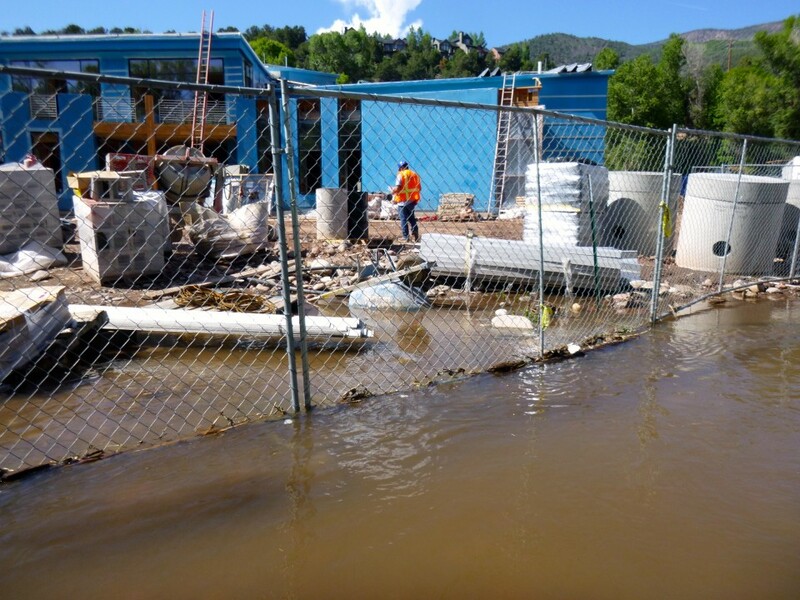 Even as the river dropped to 3,820 cfs by 5:30 p.m., water was still flowing under the construction fence surrounding the new Rocky Mountain Institute building, which was less than 20 steps from the wet edge of the expanded river. 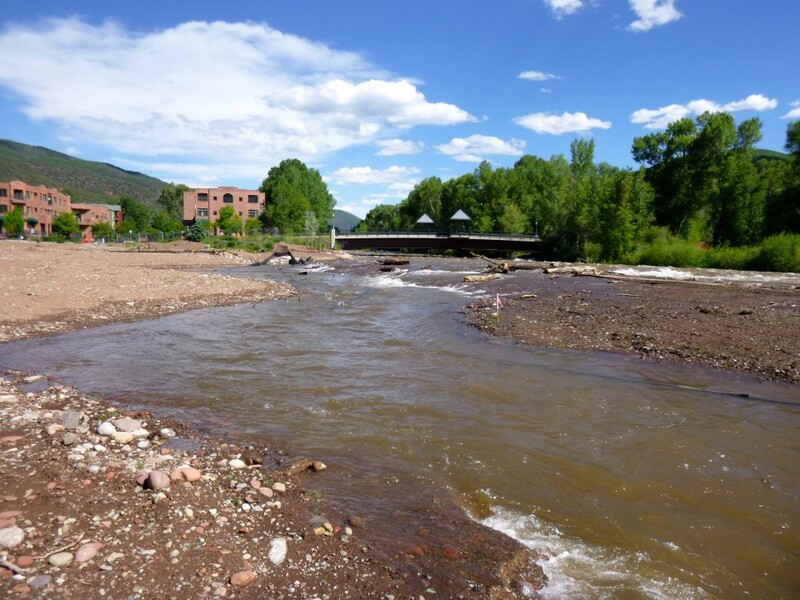 Rick Lofaro, the executive director of the Roaring Fork Conservancy, praised the way the Basalt project was flooding the riparian area along the river, while acknowledging that vegetation on much of the property had yet to be established. He said the water coming off the river, flowing broadly toward Old Town Pond, and then running back into the river, was happening as it was envisioned to. 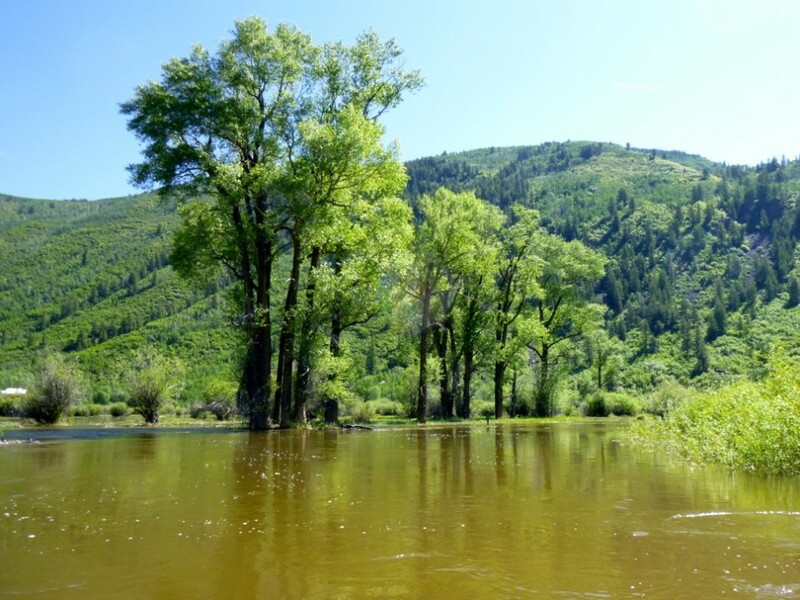 A stand of cottonwoods in high water in the Stillwater section of the upper Roaring Fork River on June 17, 2015. Lofaro also said that high river flows in general help the river’s ecosystem by flushing sediment from in between rocks and gravel, which insects like, and by watering the cottonwood galleries along the river, which need occasional flooding flows to thrive. The Roaring Fork River, as measured just above its confluence with the Colorado River in Glenwood Springs, reached, 7500 cfs at 6:30 a.m. Wednesday. That’s below this year’s peak at the confluence to date, as on June 12 the Fork was pouring 7970 cfs into the Colorado. Weyer, with county incident management team, said engineers with the city of Aspen utilities department believe that absent a significant rain event, river flows through Aspen will decrease. But a combination of heat, runoff and rain could still put more water in the river. High temperatures are expected to be in the high 80s for the next week, but there is little rain in the forecast. 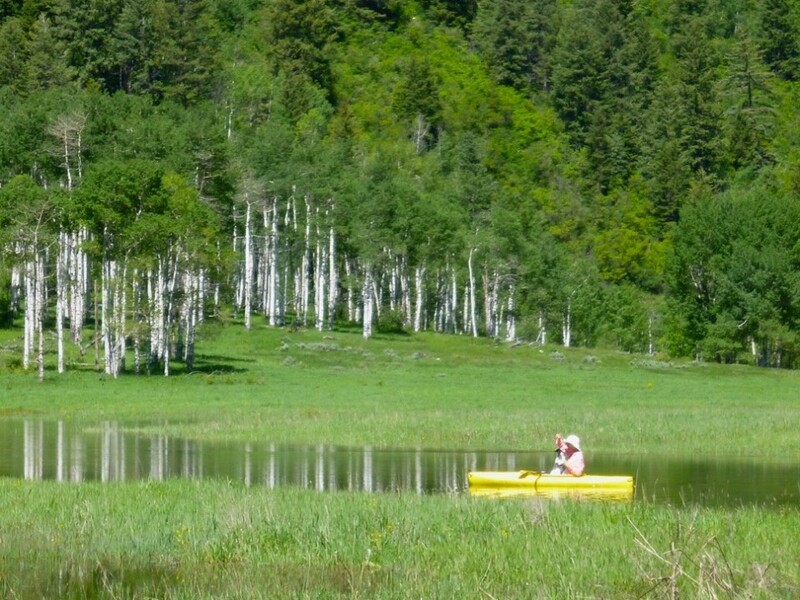 An Aspen resident on June 17, 2015 enjoys the newly formed backwaters of the Roaring Fork River along the Stillwater section east of Aspen. Additional release from Ruedi Reservoir could also keep the water flowing through Basalt high. 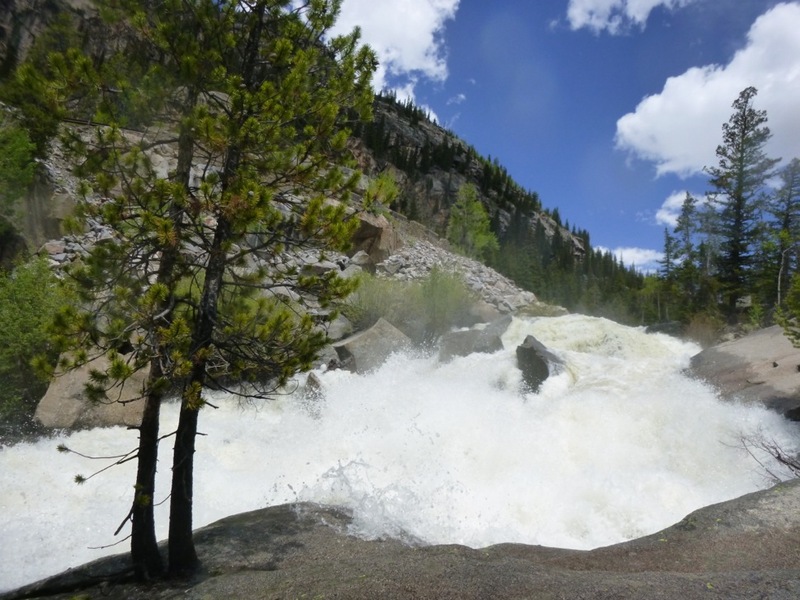 The Bureau of Reclamation announced Wednesday it would be increasing the flows of the Frying Pan river below Ruedi by 100 cfs and then another 50 cfs, and that flows in the Pan should reach 440 cfs. On Thursday, the Bureau announced it would be increasing releases below Ruedi again, this by 300 cfs, bringing the river flow to about 750 cfs. Lofaro said while that high a flow can make it harder for wading anglers, a long period of such flows would be a big benefit to the river’s ecosystem. Editor’s note: Aspen Journalism is collaborating with The Aspen Times and the Glenwood Springs Post Independent on coverage of rivers and water. Both the Times and the Post Independent published this story on Thursday, June 18, 2015.